Renal function affecting urine formation, electrolyte balance, nitrogen excretion, and vascular tone becomes acutely and/or chronically dysfunctional in metabolic, systemic inflammatory and immunological diseases of man. 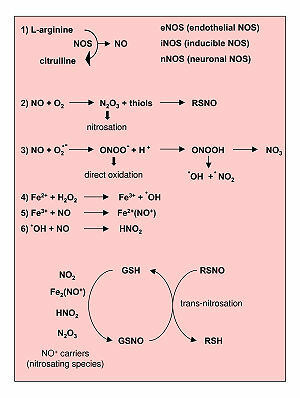 We have already described the key role that nitric oxide and the NO synthases play in reduction of oxidative stress, and we have seen that a balance has to be struck between pro- and anti-oxidative as well as inflammatory elements for avoidance of diseases, specifically involving the circulation. Similar stresses are important in the circulation, in liver disease, in pulmonary function, and in neurodegenerative disease. In this discussion we continue to look at kidney function, NO and NO donors. This is an extension of a series of posts on NO and NO related disorders. is a frequent clinical problem, particularly in the intensive care unit, where it is associated with a mortality of between 50% and 80%. This clinical entity was described as an acute loss of kidney function that occurred in severely injured crush victims because of histological evidence for patchy necrosis of renal tubules at autopsy. In the clinical setting, the terms ATN and acute renal failure (ARF) are frequently used interchangeably. However, ARF does not include increases in blood urea due to reversible renal vasoconstriction (prerenal azotemia) or urinary tract obstruction (postrenal azotemia). Acute hemodialysis was first used clinically during the Korean War in 1950 to treat military casualties, and this led to a decrease in mortality of the ARF clinical syndrome from about 90% to about 50%. In the half century that has since passed, much has been learned about the pathogenesis of ischemic and nephrotoxic ARF in experimental models, but there has been very little improvement in mortality. This may be explained by changing demographics: the age of patients with ARF continues to rise, and comorbid diseases are increasingly common in this population. Both factors may obscure any increased survival related to improved critical care. Examining the incidence of ARF in several military conflicts does, however, provide some optimism. The incidence of ARF in seriously injured casualties decreased between World War II and the Korean War, and again between that war and the Vietnam War, despite the lack of any obvious difference in the severity of the injuries. What was different was the rapidity of the fluid resuscitation of the patients. Fluid resuscitation on the battlefield with the rapid evacuation of the casualties to hospitals by helicopter began during the Korean War and was optimized further during the Vietnam War. For seriously injured casualties the incidence of ischemic ARF was one in 200 in the Korean War and one in 600 in the Vietnam War. This historical sequence of events suggests that early intervention could prevent the occurrence of ARF, at least in military casualties. to established ARF with tubular dysfunction occurs if the renal ischemia is prolonged. Moreover, early intervention with fluid resuscitation was shown to prevent the progression from prerenal azotemia to established ARF. uncontrolled accumulation of nitrogenous waste products, i.e., BUN and serum creatinine, indicated established ARF. the fractional excretion of filtered sodium (FENa = [(urine sodium × plasma creatinine) / (plasma sodium × urine creatinine)]) is less than 1%. An exception to this physiological response of the normal kidney to vasoconstriction is when the patient is receiving a diuretic, including mannitol, or has glucosuria, which decreases tubular sodium reabsorption and increases FENa. It has recently been shown in the presence of diuretics that a rate of fractional excretion of urea (FEurea) of less than 35 indicates intact tubular function, thus favoring renal vasoconstriction rather than established ARF as a cause of the azotemia. Based on the foregoing comments, this discussion of mechanisms of ARF will not include nitrogenous-waste accumulation due to renal vasoconstriction with intact tubular function (prerenal azotemia) or urinary tract obstruction (postrenal azotemia). The mechanisms of ARF involve both vascular and tubular factors. An ischemic insult to the kidney will in general be the cause of the ARF. While a decrease in renal blood flow with diminished oxygen and substrate delivery to the tubule cells is an important ischemic factor, it must be remembered that a relative increase in oxygen demand by the tubule is also a factor in renal ischemia. 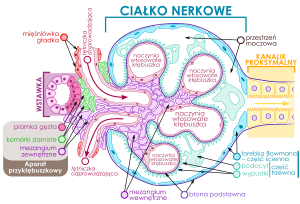 Approximately 30–70% of these shed epithelial tubule cells in the urine are viable and can be grown in culture. Recent studies using cellular and molecular techniques have provided information relating to the structural abnormalities of injured renal tubules that occur both in vitro and in vivo. In vitro studies using chemical anoxia have revealed abnormalities in the proximal tubule cytoskeleton that are associated with translocation of Na+/K+-ATPase from the basolateral to the apical membrane. A comparison of cadaveric transplanted kidneys with delayed versus prompt graft function has also provided important results regarding the role of Na+/K+-ATPase in ischemic renal injury. This study demonstrated that, compared with kidneys with prompt graft function, those with delayed graft function had a significantly greater cytoplasmic concentration of Na+/K+-ATPase and actin-binding proteins — spectrin (also known as fodrin) and ankyrin — that had translocated from the basolateral membrane to the cytoplasm. Such a translocation of Na+/K+-ATPase from the basolateral membrane to the cytoplasm could explain the decrease in tubular sodium reabsorption that occurs with ARF. The mechanisms whereby the critical residence of Na+/K+-ATPase in the basolateral membrane, which facilitates vectorial sodium transport, is uncoupled by hypoxia or ischemia have been an important focus of research. The actin-binding proteins, spectrin and ankyrin, serve as substrates for the calcium-activated cysteine protease calpain. In this regard, in vitro studies in proximal tubules have shown a rapid rise in cytosolic calcium concentration during acute hypoxia, which antedates the evidence of tubular injury as assessed by lactic dehydrogenase (LDH) release. There is further evidence to support the importance of the translocation of Na+/K+-ATPase from the basolateral membrane to the cytoplasm during renal ischemia/reperfusion. Specifically, calpain-mediated breakdown products of the actin-binding protein spectrin have been shown to occur with renal ischemia. Calpain activity was also demonstrated to be increased during hypoxia in isolated proximal tubules. Measurement of LDH release following calpain inhibition has demonstrated attenuation of hypoxic damage to proximal tubules. There was no evidence in proximal tubules during hypoxia of an increase in cathepsin, another cysteine protease. Further studies demonstrated a calcium-independent pathway for calpain activation during hypoxia. Calpastatin, an endogenous cellular inhibitor of calpain activation, was shown to be diminished during hypoxia in association with the rise in another cysteine protease, caspase. This effect of diminished calpastatin activity could be reversed by caspase inhibition. Proteolytic pathways that may be involved in calpain-mediated proximal tubule cell injury during hypoxia are illustrated. Calcium activation of phospholipase A has also been shown to contribute to renal tubular injury during ischemia. Tubular obstruction in ischemic ARF. 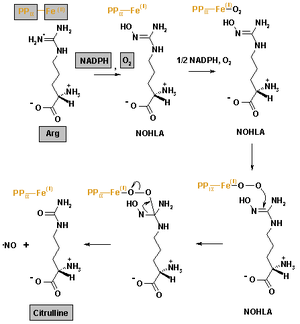 The existence of proteolytic pathways involving cysteine proteases, namely calpain and caspases, may therefore explain the decrease in proximal tubule sodium reabsorption and increased FENa secondary to proteolytic uncoupling of Na+/K+-ATPase from its basolateral membrane anchoring proteins. This tubular perturbation alone, however, does not explain the fall in GFR that leads to nitrogenous-waste retention and thus the rise in BUN and serum creatinine. Decreased proximal tubule sodium reabsorption may lead to a decreased GFR during ARF. First of all, brush border membranes and cellular debris could provide the substrate for intraluminal obstruction in the highly resistant portion of distal nephrons. In fact, microdissection of individual nephrons of kidneys from patients with ARF demonstrated obstructing casts in distal tubules and collecting ducts. This observation could explain the dilated proximal tubules that are observed upon renal biopsy of ARF kidneys. The intraluminal casts in ARF kidneys stain prominently for Tamm-Horsfall protein (THP), which is produced in the thick ascending limb. The loss of the tubular epithelial cell barrier and/or the tight junctions between viable cells during acute renal ischemia could lead to a leak of glomerular filtrate back into the circulation. If this occurs and normally non-reabsorbable substances, such as inulin, leak back into the circulation, then a falsely low GFR will be measured as inulin clearance. It should be noted, however, that the degree of extensive tubular damage observed in experimental studies demonstrating tubular fluid backleak is rarely observed with clinical ARF in humans. Moreover, dextran sieving studies in patients with ARF demonstrated that, at best, only a 10% decrease in GFR could be explained by backleak of filtrate. Cadaveric transplanted kidneys with delayed graft function, however, may have severe tubular necrosis, and thus backleak of glomerular filtration may be more important in this setting. There is now substantial evidence for the involvement of inflammation in the pathogenesis of the decreased GFR associated with acute renal ischemic injury. In this regard, there is experimental evidence that iNOS may contribute to tubular injury during ARF. Hypoxia in isolated proximal tubules has been shown to increase NO release, and Western blot analysis in ischemic kidney homogenates has demonstrated increased iNOS protein expression. An antisense oligonucleotide was shown to block the upregulation of iNOS and afford functional protection against acute renal ischemia. Moreover, when isolated proximal tubules from iNOS, eNOS, and neuronal NO synthase (nNOS) knockout mice were exposed to hypoxia, only the tubules from the iNOS knockout mice were protected against hypoxia, as assessed by LDH release. The iNOS knockout mice were also shown to have lower mortality during ischemia/reperfusion than wild-type mice. There is also evidence that the scavenging of NO by oxygen radicals produces peroxynitrite that causes tubule damage during ischemia. While iNOS may contribute to ischemic injury of renal tubules, there is evidence that the vascular effect of eNOS in the glomerular afferent arteriole is protective against ischemic injury. In this regard, eNOS knockout mice have been shown to be more sensitive to endotoxin-related injury than normal mice. Moreover, the protective role of vascular eNOS may be more important than the deleterious effect of iNOS at the tubule level during renal ischemia. The basis for this tentative conclusion is the observation that treatment of mice with the nonspecific NO synthase (NOS) inhibitor L-NAME, which blocks both iNOS and eNOS, worsens renal ischemic injury. It has also been demonstrated that NO may downregulate eNOS and is a potent inducer of heme oxygenase-1, which has been shown to be cytoprotective against renal injury. The MAPK pathway also appears to be involved in renal oxidant injury. Activation of extracellular signal–regulated kinase (ERK) or inhibition of JNK has been shown to ameliorate oxidant injury–induced necrosis in mouse renal proximal tubule cells in vitro. Upregulation of ERK may also be important in the effect of preconditioning whereby early ischemia affords protection against a subsequent ischemia/reperfusion insult. Alterations in cell cycling have also been shown to be involved in renal ischemic injury. Upregulation of p21, which inhibits cell cycling, appears to allow cellular repair and regeneration, whereas homozygous p21 knockout mice demonstrate enhanced cell necrosis in response to an ischemic insult. multiorgan dysfunction syndrome (80–90% mortality). Until means to reverse the diminished host defense mechanisms in azotemic patients with clinical ARF are available, every effort should be made to avoid invasive procedures such as the placement of bladder catheters, intravenous lines, and mechanical ventilation. Over and above such supportive care, it may be that combination therapy will be necessary to prevent or attenuate the course of ARF. Such combination therapy must involve agents with potential beneficial effects on vascular tone, tubular obstruction, and inflammation. Schrier RW, Wang W, Poole B, and Mitra A. Acute renal failure: definitions, diagnosis, pathogenesis, and therapy. The Journal of Clinical Investigation 2004; 114(1):5-14. Shelgikar PJ, Deshpande KH, Sardeshmukh AS, Katkam RV, Suryakarl AN. Role of oxidants and antioxidants in ARF patients undergoing hemodialysis. Indian J Nephrol 2005;15: 73-76. Lee JW. Renal Dysfunction in Patients with Chronic Liver Disease. Electrolytes Blood Press 7:42-50, 2009ㆍdoi: 10.5049/EBP.2009.7.2.42. Saadat H, et al. Endothelial Nitric Oxide Function and Tubular Injury in Premature Infants. Int J App Sci and Technol 2012; 7(6): 77-81. www.ijastnet.com. Amaresan MS. Cardiovascular disease in chronic kidney disease. Indian J Nephrol 2005;15: 1-7. S Vikrant, SC Tiwari. Essential Hypertension – Pathogenesis and Pathophysiology. J Indian Acad Clinical Medicine 2001; 2(3):141-161. Pathogenesis of salt dependent hypertension. The hypothesis proposes that early hypertension is episodic and is mediated by a hyperactive sympathetic nervous system or activated renin-angiotensin system. Hypotheses linking abnormal ionic fluxes to increased peripheral resistance through increase in cell sodium, calcium, or pH. The hypertension that is more common in obese people may arise in large part from the insulin resistance and resultant hyperinsulinaemia that results from the increased mass of fat. However, rather unexpectedly, insulin resistance may also be involved in hypertension in non-obese people. Proposed mechanisms by which insulin resistance and/or hyperinsulinemia may lead to increased blood pressure. Enhanced renal sodium and water reabsorption. Summary: This portion of the discussion concerns mainly acute renal failure, but also expands upon the development of longer term renal tubular disease. The last consideration is the link between essential hypertension, obesity and insulin resistance, and impaired renal water retention, sodium retention, decreased Na+/K+ – ATPase activity. The issue of early intervention with fluid resuscitation is tempered by the risk of pulmonary edema as a significant complication. A review of the literature indicates that both eNOS and iNOS have counter-effects in the genesis of ARF and CRF. The protective role of vascular eNOS may be more important than the deleterious effect of iNOS at the tubule level during renal ischemia.